Isuru attended the second annual Edinburgh Super Resolution Imaging Consortium (ESRIC) symposium, held this year at the Institute of Genetics and Molecular Medicine (IGMM) of the University of Edinburgh (UoE). His talk on the Molecular-scale imaging of ryanodine receptors at both the cell surfaces and interiors with the adaptation of DNA-PAINT was well-received by a range of researchers based in Edinburgh and regionally in Europe. Highlights from this meeting included a number of world class investigations led by research fellows and academics in UoE and Heriot Watt University. Of note, were Dr Colin Rickman’s talk on using naturally occurring enzymes as super-resolution imaging probes, Dr Lynn Paterson’s adaptation of optofluidic devices and optical tweezers for developing novel optical tools for cell biology. The plenary speaker was Prof Christophe Zimmer (from Institut Pasteur) who spoke about the adaptation of artificial neuronal networks (a tool called ANNA-PALM) to speed up super-resolution microscopy and demonstrate high throughput imaging of structures such as microtubules, nuclear pore complexes and mitochondria. We now eagerly anticipate his paper on ANNA-PALM out in press very soon. The conference was organised by Dr Ann Wheeler and colleagues of the ESRIC and showcased their world class line up of microscopy platforms including a state-of-the-art Nikon STORM and SIM instrument and a Leica STED system. On the back of our recent publication in Cell Reports, our research has enjoyed a wide ranging body of TV coverage. This included 20+ online newspapers and science & technology websites. Among this coverage, was a brief recording for the local television station Made in Leeds which was featured on the 6:30pm news on 11/1/2018. Here is the link to a clip where Isuru is explaining the context and the value of the super-resolution microscopy technology in studying both healthy and disease physiology of the heart. Featured in the video, was Miriam during one of her imaging experiments. Recent work of researchers from the Universities of Exeter, Leeds and Cambridge has been featured in a number of press reports. Here at the University of Leeds, Dr Isuru Jayasinghe’s group is utilising multiple super-resolution microscopy techniques to reveal further the fine structural properties of the heart within health and disease. Our latest paper together with Christian Soeller’s group is now available with open access. In this paper, we utilise the recently-described DNA-PAINT technique to achieve optical resolutions of ~10 nm as a clear improvement over the more widely used dSTORM super-resolution technique. With the improved resolution, we were able to visualise and ‘count’ individual proteins which are clustered tightly within intracellular signalling nanodomains in muscle cells of the heart. From this analysis, we learned that the giant ryanodine receptor calcium release channels are organise more loosely and heterogeneously than previously thought. It also appeared that from cluster to cluster, their calcium release properties may be regulated more differentially by varying degrees of co-clustering with regulatory protein junctophilin-2. 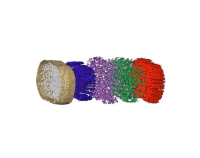 The study itself was also a demonstration that the enhanced resolution and the new protein ‘counting’ tools are promising new tools for studying molecular-scale biophysics in excitable cells. The picture above illustrates, with correlative image, the remarkable improvements made by the recent dSTORM and DNA-PAINT techniques over traditional optical microscopy methods like TIRF which were state-of-the-art only ~ 13 years ago.